My hometown school committee, voted 4 to 3 to keep a prayer posted on the wall of the auditorium intact, despite its violation of the First Amendment. 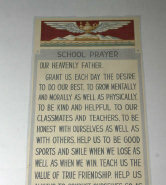 The prayer, Our Heavenly Father, written by a student in the class of 1963 was a gift to the succeeding classes. I must have sat in that auditorium hundreds of times. But I have no memory of it. According to an article in the Providence Journal, 4,000 people signed a petition to keep the prayer intact. The ACLU received a complaint last July and gave the school committee eight months to resolve it. The Committee resolved it by deciding against removing it. Now the ACLU will file a lawsuit to have it removed. I hate to say it but the handwriting was literally on the wall.